Founded in 1904 in Denmark, Oticon is one of the oldest hearing aid manufacturers in the world. With over a century of experience, Oticon is a leader in research and innovation for hearing solutions. With research and development from the Ericksholm Research Institute, Oticon hearing aids combine innovative hearing aid features with cutting edge technology that continues to push the envelope for hearing aid design. Velox is Oticon’s latest processing platform, an ultra-fast and precise operating system. Powered by a tiny chip that runs at a high speed, Velox offers a 64-band frequency resolution, which gives Oticon wearers clearer sound quality. Velox’s 20% reduction in listening effort and 20% more capacity hearing aid wearers to remember both assist with the brain’s auditory process. Additionally, Velox provides wearers with 30% better speech understanding and clarity in noise, compared to previous models of Oticon hearing aids. Velox’s “open sound solution” gives wearers the experience of a full soundscape, even in the most challenging sound environments. With this open sound solution, OPN (pronounced “open”) hearing aid wearers are empowered to focus on the sounds they want to hear, while experiencing significant cognitive benefits. Powered by the Velox processing platform, OPN provides wearers with access to a full soundscape, even in the most challenging environments. Unlike traditional hearing aids which suppress certain sounds and amplify others, OPN provides wearers with a fuller spectrum of sound in their environment, thus engaging the brain in the auditory process. With enhanced, richer audio information, OPN provides wearers with a natural listening experience, which allows them to take in environmental sounds and decide which sounds they want to hear. OPN’s main feature is the OpenSound Navigator Environmental Analyzer. Powered by Velox, OpenSound Navigator scans the full 360 degrees of the wearer’s current listening environment 100 times a second. During this process, algorithms analyze, and balance every sound. With this rich sound picture, OPN wearers are more fully connected to their environment. As a wireless hearing aid, OPN offers TwinLink technology – two wireless communication systems in one. OPN uses near-field magnetic (NFMI) to connect the two OPN hearing aids, creating a network of microphones to simulate natural binaural hearing. Also endowed with Bluetooth technology, TwinLink connects OPN hearing aids to smartphones, which enables wearers to stream phone calls, music, and other media directly to their ears. For even more advanced connectivity, OPN is the first hearing to connect directly to the Internet. Through a collaboration with the website, If This Then That (ITTT), OPN hearing aids are able to capture and stream sounds commonly experienced in daily life (doorbells, baby monitors, alarms, thermostats, security systems, etc.). Oticon is best known for their groundbreaking BrainHearing Technology, which is designed on the way our brains hear in the auditory process. When our ears pick up sounds, the sound waves travel through our middle ear to the inner ear, where they are translated into neural signals registered by the brain as sound. 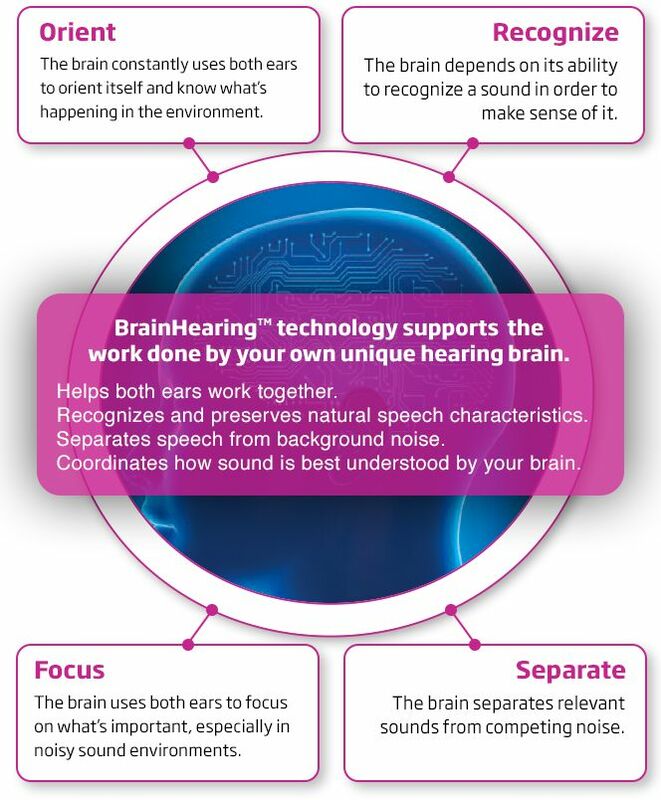 Hearing loss interferes with this process, and that’s where BrainHearing Technology steps in. 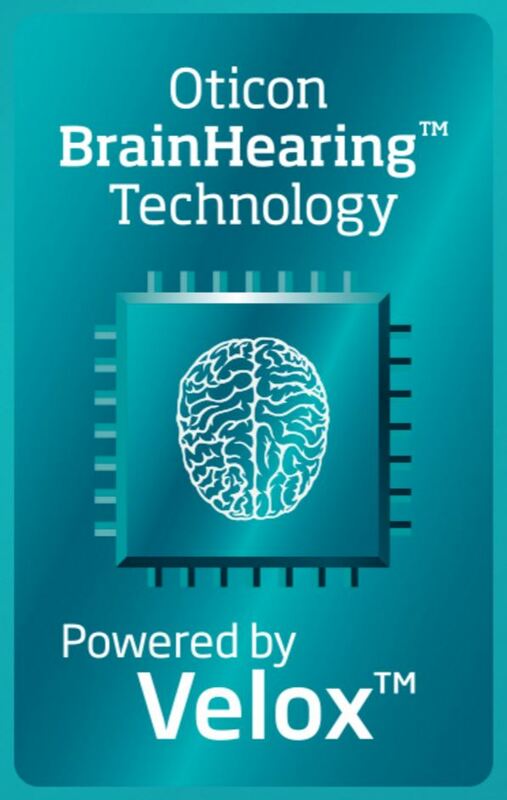 With four features, BrainHearing Technology works in conjunction with the brain’s processes to ensure better hearing. Speech Guard E supports speech recognition and provides clarity even in background noise. With hearing loss, people struggle to locate the directions from which sounds come. Spatial Sound helps wearers locate the source of sound and supports the brain’s natural ability to sense the direction from which sounds come. FreeFocus is an automatic zoom feature that allows wearers to focus on specific sounds they want to hear. With the understanding that hearing is an incredibly personal experience, YouMatic is a feature to allow Oticon hearing aid wearers personalize their listening preferences. BrainHearing Technology is available in Oticon’s Alta 2, Nera 2, and Ria 2 hearing aids, which are worn completely-in-canal (CIC) or invisible-in-canal (IIC). They are fully customizable and also come with tinnitus therapy options.